A couple of weeks ago, I was chatting with my friend Daina after a yoga class and, as it often does, the conversation turned to food. Daina is a master gardener and a talented cook who crafts healthy and delicious recipes with ease. When she mentioned her favorite go-to dinner which incorporated her homemade cashew milk, I was intrigued. I have long thought I should make my own almond milk. My sister has been doing it for years, and I pour it in my morning oatmeal almost daily. Yet, for some reason, I always buy it. I think it is the straining step that makes the process seem somehow cumbersome. That is probably silly. Yet, when Daina mentioned that cashew milk didn’t require straining, as the cashews are much softer, once soaked, than almonds, I bit. As much as I like almond milk, I also envisioned a slightly different flavor that really appealed to me. No additives either! I am here to report that, not only is this process easy, it will reward you with the freshest, ever-so-slightly-sweet milk that I have grown to look forward to using, whether in my morning oatmeal, smoothies, or several other recipes that are on my list of “have to share” recipes! By the way, for Daina’s go-to dinner, she combines some of the cashew milk with her favorite tomato sauce to make a luscious pink sauce, adds peas and whatever veggies she has on hand, and then mixes in cooked pasta. 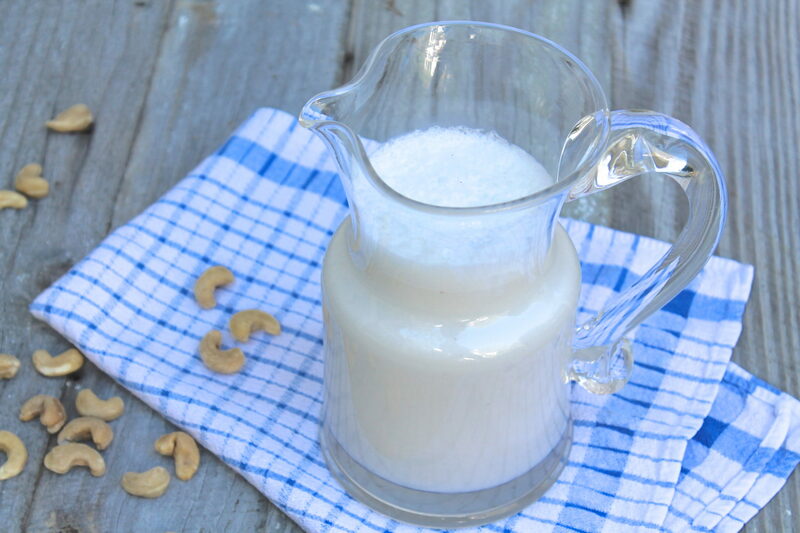 I also look forward to using cashew milk in recipes where I would typically use coconut milk. Added note: I do not have a Vitamix (maybe someday!) and was successful making this milk in my basic blender. No need for a fancy blender to make this delicious milk, and no need to strain like almond milk. While there may be the slightest trace of fine cashew pieces at the bottom of your pitcher, it is negligible, not at all grainy, and tastes terrific! To soak the cashews, place them in a bowl and cover with water by about an inch. Allow to sit for approximately 8 hours but no more than about 12 hours. Discard the soaking water and rinse cashews thoroughly. You want the water to run clear. Place the cashews and 2 cups of the fresh water in a blender and blend for one minute. (At this point, you have a delicious and healthy alternative to half and half or light cream.) Add the remaining 2 cups water, the maple syrup, and the salt to the blender. Blend for one more minute or until the mixture is completely smooth, scraping the sides if needed. Store in a covered pitcher or large mason jar(s) in refrigerator. The cashew milk will stay fresh for a week or more. Stir or shake before using. Using four cups of water to one cup of cashews, the milk will have the viscosity of whole milk; if you want to make milk with the consistency of 2% milk, add another cup of water. For light cream, use 2 cups of water in the above recipe. The milk will be slightly foamy immediately after blending. The foam will settle and can simply be stirred into the milk. Shared with Recipe for My Boys Thursday’s Treasures. Wow! Something else I need to try Ann. So easy too. I have a terrific Breville blender that would probably work very well for this. I have been wanting to try cashew milk for awhile…. do you have a high speed blender like a vitamix, or will a regular one work?? I hope a regular one will work!!! I use a regular blender and it turns out great, Sarah. The cashews do become very soft when soaked, and I think starting with less water for the initial blend helps to really pulverize and incorporate all the tiny pieces. For times that I didn’t shake or stir before using, I did notice a little cashew “sediment” at the bottom of my pitcher as I poured the last cup, but it still tasted perfect. Ooooh, I cannot wait to try this! Delicious! I forwarded this onto a co-worker who made it. I think I would keep forwarding recipes to him, Janie! So glad he made it and that you enjoyed! about anything that can maximize the metabolism, also can raise the weight reduction even if the human being is just resting.